The old-fashioned look of a custom routed or sandblasted sign from The Denver Print Company can serve both to visually set your business apart from surrounding businesses and to cast the perfect tone for your customers before they even walk in the door. Routed & Sandblasted: What's the difference? Both sandblasted and routed signs have a similar antiquey kind of look and are made from the same types of material. They ways in which they are produced, however, are quite different. Both types start with a solid, blank sheet of the sign material. For routed signs, the blank sheet is painted the background color of the design, and the letters and graphics are carved down into the material. The carvings are then painted the appropriate color. In the case of sandblasted signs, the blank material is masked with a computer plotted rubber sandblast stencil and the background is then sand-blasted down, so that the lettering and design stand up, in relief. Today’s routed and sandblasted signs do not have to made from wood. While wood is still an option, modern signs can be made from a variety of high tech materials. PVC plastic, HDU (high density urethane - a high density foam), acrylic, and even metal are used. While signs made from these materials can be designed and routed to have their own unique look, many are made to replicate the eye-catching appeal of a hand routed wooden sign. In some cases, these newer materials provide design options that are not available with wooden routed signs. HDU, for example, can be carved to produce a stone-like finish. HDU can be used to produce a thicker sign, up to 12 inches, but wood is a stronger material for longer, flatter signs. Weather resistance is something to consider as well. Wood signs can warp or crack in extreme temperature and moisture situations, whereas HDU is engineered to be 100% weatherproof. If you are interested in a routed sign, Denver Print Company can consult with you on your project to help find the best material for your sign. 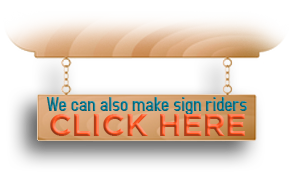 Contact the Denver Print Company today to discuss your routed or carved sign project! Decorative routed wooden signs were some of the first storefront signs ever used. 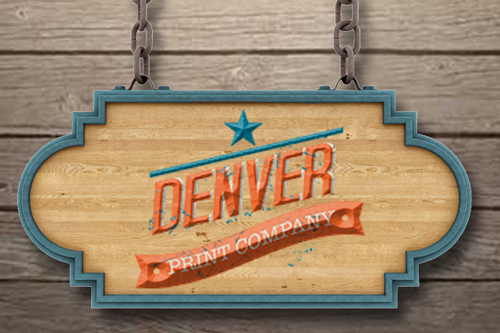 A made to order wooden routed sign from The Denver Print Company can set the perfect tone for your customer before they even walk in the door. Of course, today’s routed signs do not have to made from wood. While wood is still an option, modern routed signs are made from a variety of high tech materials. PVC plastic, HDU (high density urethane – a high density foam), acrylic, and even metal are used. While signs made from these materials can be designed and routed to have their own unique look, many are made to replicate the eye-catching appeal of a hand routed wooden sign. In some cases, these newer materials provide design options that are not available with wooden routed signs. HDU, for example, can be carved to produce a stone-like finish. HDU can be used to produce a thicker sign, up to 12 inches, but wood is a stronger material for longer, flatter signs. Weather resistance is something to consider as well. In extreme temperatures and moisture situations, wood signs can warp or crack, whereas HDU is engineered to be 100% weatherproof. If you are interested in a routed sign, Denver Print Company can consult with you on your project to help find the best material for your sign.